JAISAL NOOR, TRNN: Welcome to the Real News Network. I’m Jaisal Noor in Baltimore. The Chicago Teacher’s Union voted to go on strike on October 11th unless they get a new contract. The nearly 30 thousand members of CTU have been working without one for over a year. Key in the negotiations is the issue of school funding. This week alone, budgets were slashed by some 45 million dollars at city schools. 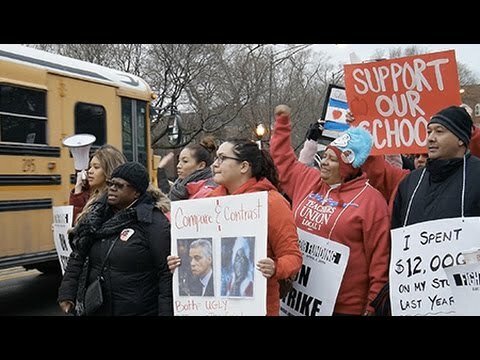 Chicago is the third largest school district in the country and like the previous 7-day strike in 2012, this also comes at an election year and pits democratic Mayor Rahm Emanuel a close ally of President Obama and the Clintons against the militant Caucus of Rank and file Educators or CORE that helms the Chicago’s Teacher Union. I was in Chicago for a one-day strike that took place on April 1st and spoke to parent Zerlina Smith. ZERLINA SMITH: Schools are being underfunded because they refuse to tax the wealthy, the 1% who gets everything and children of color are the mains ones who are effected. Look at this school and its community. The murder rates are the highest at the city of Chicago and most [im]poverish colored communities. So I’m out here to make sure that if our children can’t get the basic necessities that they get the quality of education that they deserve. NOOR: Well we’re now joined by two gets from Chicago. Sarah Chambers is a special education teacher and a member of the Chicago Teachers Union executive board and the co-chair of CORE, the Caucus of Rank and file Educators. We’re also joined by Micah Uetricht. He’s an associate editor of Jacobin magazine. He’s the author of Strike for America: Chicago Teachers Against Austerity, which is about that 2012 strike. Thank you both for joining us. NOOR: So Sarah let’s start with you. So you’re actually a teacher at Zerlina Smith’s school [inaud.]. I wanted to ask you, why a strike and get your response to Chicago Public Schools CEO Forrest Claypool. He said that Chicago Public Schools are doing everything possible to avoid interrupting students learning, a strike would harm children, and it would halt the great problems that kids are making. It would make an enormous burden for families. So why a strike and how do you respond to those that say this is going to hurt families and students? CHAMBERS: Well we’ve been bargaining for 450 days now and we’re fighting for what’s right to save our public schools. Claypool is wrong. He is not–him and the board of education and Rahm Emanuel, they have not done everything for our schools. They’re not fighting for progressive revenue like we are, they’re not going down to Springfield also to fight for progressive revenue. Right now the Chicago Teachers Union, we’re pushing for a TIF surplus ordinance that would actually take money out of the TIFs which is Tax Increment Funding which is basically a mayoral slush fund and bring that money to the schools. Right now a lot of this money is going towards wealthy districts, towards downtown, towards for example remodeling bathrooms at the board of trade, going towards the United Airlines. This money needs to be going towards our schools. All you hear Claypool and the board of education talking about is making more and more cuts. In the schools we’re bare bones. We can’t take any more cuts. In my school with 1,200 students, we only have a nurse about 2 days a week and many schools only have 1 counselor. We’re down in–we’re 600 schools now and we only have librarians in one fourth of the schools. Majority of our schools don’t even have librarians and our class sides are skyrocketing. We want to come to a deal. That’s why we’ve been bargaining for so long. But ultimately we have to do what’s right for our students and right now we have to strike. The board of education has shown that they’re not ready to come to a deal without us withholding our labor and we’re sad that it’s come to this but we will strike to protect our students. NOOR: And so Micah can you talk about the significance of this. You covered the 2012 strike and that was a historic strike because at a time when unions are in decline, they’re under attack, it was the Caucus of Rank and file Educators which Sarah is a part of that sort of took the fight to the elites that control Chicago and that where Chicago was a testing ground for these neoliberal education reforms that we see across the country. UETRICHT: Yea Sarah’s caucus, the Caucus of Rank and file Educators, when they took over the union in 2010 they really had a different vision for doing unionism than previous leadership had in the union. I would say most leaderships of unions are on the country path which is that they believe that their power would come from democracy within the union, for militants even the willingness to go on strike and they showed the power of that in 2012 when I think that everyone universally recognized that the teachers won the strike in 2012. In 2012, labor was and continues to be a really rough place. The percentage of unions, the united workers, they’re all-time lows since the Great Depression. We have strikes at incredibly low numbers around the country. But the CTU showed a couple things in 2012. One you could go on strike in 2012 at a time when labor was really weak and still win. Not only win a strike but win against a real power player in the democratic party Rahm Emanuel and you could stop this agenda, the corporate education reform agenda, the neoliberal education reform agenda, that had pretty much been just steamrolling across the country. That it had faced very little resistance around the country. So they showed that in 2012 and they did that through withholding the labor but not just withholding the labor but making their strike a strike that is for not just for winning better healthcare or pay raise or anything but really about advancing a broad vision of social justice for all people, for students especially in Chicago. At the time in 2012, we saw polls repeatedly showed the overwhelming numbers of Chicago especially even CPS parents, were backing the Chicago Teachers Union and that’s still true today. Newspapers like the Chicago Tribune keep doing polling asking CPS parents, the very people that would be inconvenienced by a CTU strike, do they support the Chicago Teachers Union or do they support Rahm Emanuel and the answer is still overwhelmingly that they support the CTU. So this is a significant thing. The CTU has emerged over the last 6 years as the principle political force in Chicago that is opposing Rahm Emanuel and his neoliberal democratic politics and this is a unique thing in any city around the country. NOOR: And Sarah I was also in Chicago for the strike in 2012 and I noted how the media covered not only the strike but just unions in general in Chicago. The corporate media especially was covering the actions with disdain, with contempt, and Micah just cited some polls but the mass media does have an impact on parents and people in the community that rely on it for their information. What is CTU’s plan to reach out to the community before and during the potential strike and how to keep those lines of communication open. SPEAKER: Well first of all, independent news sources like you all are very important and social media. Facebook and Twitter, a lot of our parents use it, a lot of our students use it and we’re sending our messages that way/ And we’re just doing a lot of leaf looting of parents. Last week at my school we had a bunch of teachers going out before school and after school talking to parents 1 on 1, flyering parents and saying hey there is money out there. There are progressive revenue services. There are potentially even taxes on the wealthy and its shouldn’t keep hitting working people. That the wealthy should pay more and that money should go into the schools. We’re also having a walk in which is kind of like a rally on October 6th that’s a nationwide walk in. 40 districts in Illinois are also participating and where we will be rallying in front of the school with parents, with community organizations, we’ll have speakers, maybe singing, chanting, and we’ll be getting our message out there. Because a lot of times the corporate media, you know they’re friends with Rahm, they’re just showing the side of the board, and they’re not showing our side, that we’re really hear to fight to save the public schools. And they always make teachers out to be greedy and that’s not the case. We wanted to be treated as professionals and currently teachers make on average 17% less than people who have our same education certification backgrounds. So you know we wanted to be treated as professionals and we really want to be here to fight for the schools that our students deserve. NOOR: And finally, Micah let’s end with you. 2012 was also an election year and what’s interesting about the vote then and the vote now is that the members of CTU surpassed the official threshold to be able to strike by a wide margin which I believe is 75% of the union must vote for the strike and that was actually established as part of this neoliberal education reform in 2011. You’ve written about that. This year, something like 95% of teachers voted to authorize the strike just this week. So talk a little bit about more about the role of CTU and CORE and sort of fighting this education reform nationwide and what this means for unionism across the country. UETRICHT: Sure to your first point about this threshold the union has to meet, shortly after CORE took office in 2011, at the state level there was a bill that was passed that raised the threshold from a simple majority of voting union members voting to a 75% of all members’ margin that was required for the union to authorize a strike. That’s obviously an incredible number. If we had to elect a president in the United States, no one would ever get elected on a margin like that. But because of the way that the CTU has implemented this democratic style of unionism, we saw that they’re able to produce those numbers again and again because they actually are a democratic union that is actually in touch with its rank and file membership. So they have overwhelming numbers within their rank and file who are willing to go out and fight for this vision that they have put forward about social justice for all students and for all Chicago. It’s just like it was in 2012, it’s a huge testing case because everyone will be watching Chicago. Everyone who wants to institute more corporate reforms, who wants to get rid of teacher [inaud.] who wants to expand charter schools, who wants to break teachers’ unions, will be watching Chicago to see if Rahm Emanuel is able to defeat the CTU this time. If he is then it’ll have pretty terrible consequences I think for lots of teachers’ unions and the labor movement as a whole around the country. But if the CTU is able to stick it out I think we’ll see an embroiled teachers’ unions and hopefully labor more generally in the near future. NOOR: I know I said last question but I have one last question for Sarah. This is an election year. CTU and especially CORE and sort of this rejuvenised union movement, it had close ties and alliances with people like Bernie Sanders. We know Hillary Clinton is the nominee. Are you expecting any support from the democratic party nationally? We know they need your votes. Some say that they take the votes of teachers for granted. Are you expecting anything and what is your message to Hillary Clinton during this election season? CHAMBERS: I mean unfortunately a lot of the big democratic machine type candidates like Hillary Clinton have not been very supportive of our public schools. They’ve tended to support charters and as you’ve probably seen Hillary Clinton also receives a lot of money from banks. I’m hoping our strike will put pressure on the democratic party. Just to say that you know they need to fight for working people and fight for unions and fight to save the schools. I mean around the country you’ve seen what happens. In New Orleans they have no public schools left. They’re all charter schools. In places like Philly and Detroit they’re becoming majority charter schools as well and the democratic party needs to be pushed. I’d like to see a third party happen at some point in time just because right now both parties are not pushing in favor of the public schools and we really need to fight back. But as you see now with Rahm Emanuel because of us striking in all the protests that’s happening around the city, Rahm Emanuel, he’s kind of the trash of the democratic party. They made fun of him at the democratic national convention and so I think the democratic party is going to try to stay as far away from Rahm as possible because he’s not really helping them. NOOR: Alright well we’re going to certainly keep following the story. Thank you both for joining us. I appreciate it. NOOR: Thank you for joining us at the Real News and go to the RealNews.com for all of our coverage of the Chicago teacher’s strike, whether it’s the one on April 1st or 2012. We were there for the entire strike and we have done several stories on it. Thank you so much for joining us. recording of the program. TRNN cannot guarantee their complete accuracy. Sarah Chambers is a special education teacher and a member of the CTU executive board and the cochair of CORE, the caucus of rank and file educators. Micah Uetricht is an associate editor of Jacobin magazine. He is the author of Strike for America: Chicago Teachers Against Austerity. Is Sanders’ Democratic Socialism … Socialism?